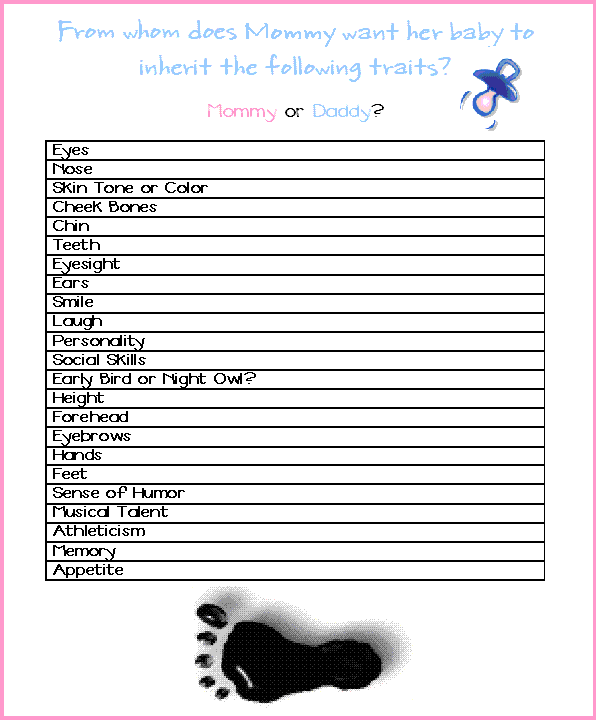 This is the Mommy's Perfect Baby Traits baby shower game. This is a fun game that gets everyone thinking about what the new baby will look like! Preparation for this free baby shower game: Before the shower, make a list of the mother-to-be's idea of the perfect baby in terms of physical characteristics and personality traits, and have the expectant mother fill it out. Print out a copy of the free printable "Perfect Baby" game card below for each guest. How to play this game: During the shower, give each guest a copy of the list of the ideal baby characteristics and a pen. Have each guest fill out the paper, trying to guess what the mother would prefer. The guest with the closest guesses to the mommy-to-be's list is the one who thinks the most like she does, and therefore wins the game! Click here for more baby shower game ideas! This game is free for your PERSONAL use.